This is a project I’ve been working on a couple of months now. 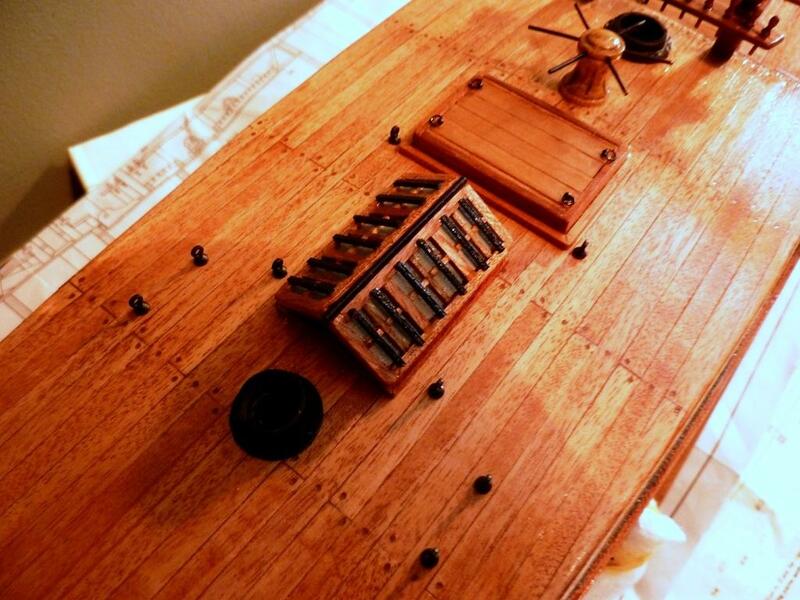 It’s Mantua’s 1/60 model of the Bark Endeavour, which I’m developing into a diorama. I bought the kit in an online auction for £30; it still retails for £160+ so it may seem like a good deal. However, the kit had been in someone’s loft (attic) since 1986 and a lot of it was missing. The plans were glued together in places, torn apart, and generally in poor condition. I found that duplicate plans were available and bought these as a way forward. I was surprised to find that the Mantua 1986 plans were wholly different from the later version (circa 2006). I also had the Anatomy of a Ship book of the Endeavour, which differed again from the two sets of plans. 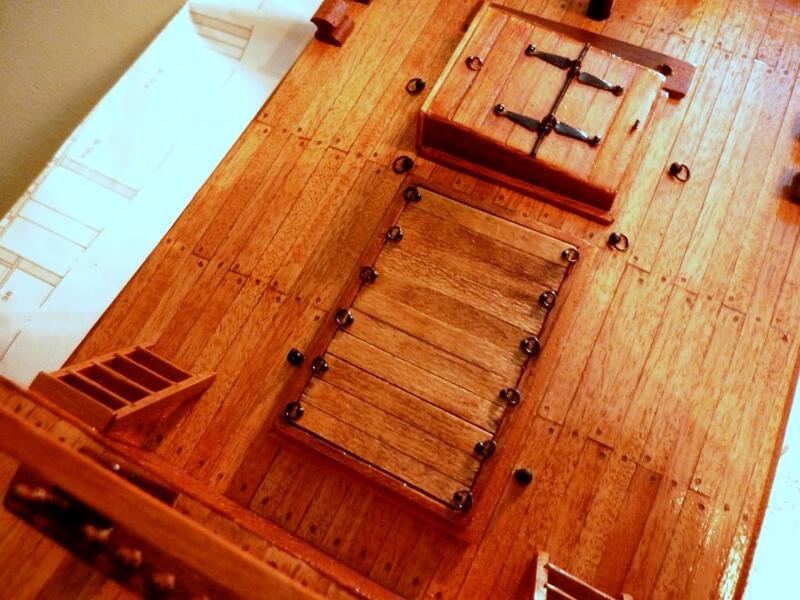 Whoever had started the kit had glued the transoms to the false keel, and set the deck boarding in place, some of the later being installed upside down, which may not seem to be an issue, but there are openings that have to be in certain locations, and weren’t. 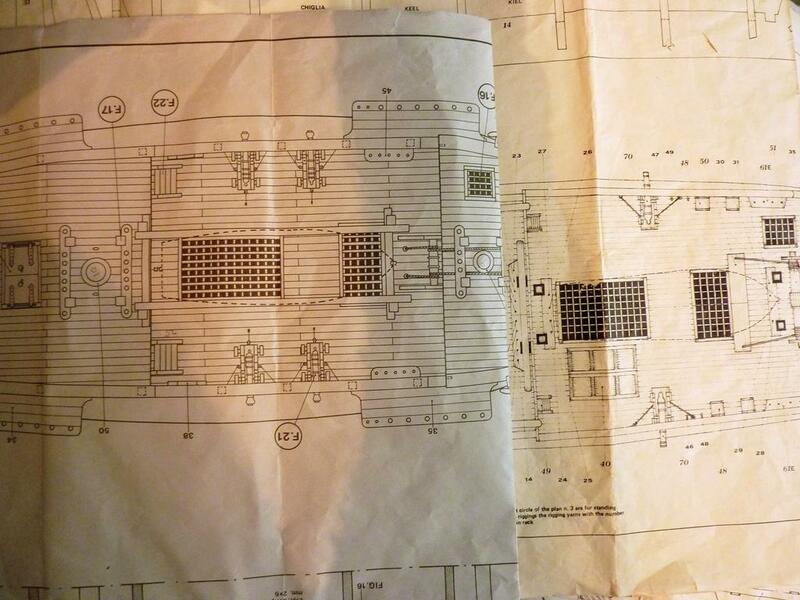 In the final photo here a few discrepancies can be seen, and the gratings across the openings are repeated in both sets of plans but are factually incorrect. Further, the original modeller had attempted to plank the hull, which was a single-plank operation and so had to be a pristine finish. Unfortunately this was not the case. There was considerable gapping between planks and the work had ceased as it approached the bow. I think this may have been the point where the model was abandoned. I completed the first hull planking to achieve the correct lines and curves and then second-planked the ship with a good quality walnut strip. From there, it’s been a case of mix-and-match, deciding what could be left out and what retained. In the latter case I’ve purchased various aftermarket accessories to add the necessary detail, at least to a degree. Because of certain imperfections in the design of the kit itself, some things aren’t possible to amend/improve. I also planked the decks at this stage and added trenails details. The project is a diorama. HMB Endeavour began as the collier The Earl of Pembroke along the Northumberland coast in the mid-18th century. The Admiralty purchased the ship and refitted it at Deptford in 1786 for the Cook Expedition. 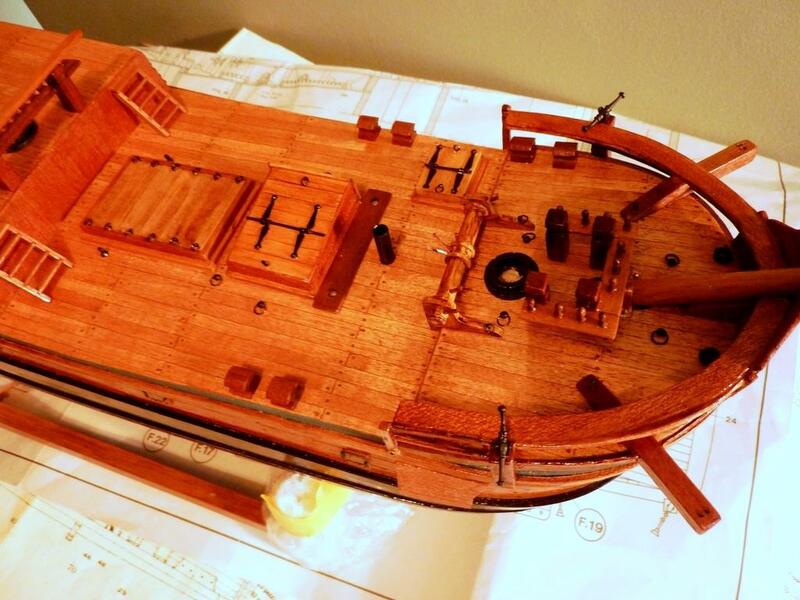 My project will show the ship during the conversion process, in drydock, surrounded in scaffolding and so forth, with a few dozen figures attending to various aspects of the refit. With this as the scenario, the ship won’t be completed as a standard three-mast vessel. Some areas will be complete, others not. Some basic rigging in place, but not much else. I’m still working on the deck furniture, but again I’m now in a position that I have to decide what to show as complete, and what will be in progress. Probably another month or two on the ship itself, before I begin the diorama part of the build. The gloss varnish finishes are simply a brush-applied hardshell gloss to protect the paintwork, and the model will be sprayed with a matt varnish in due course. You may notice the brown hull. Hulls at this time were coated in either “the white stuff” (train oil, resin and sulphur) or “the brown stuff” (tar, pitch and sulphur). The white stuff being more expensive, it was used less widely. However, the example of model ships’ hulls finished in white is something that has persisted, although in practice not generally correct. Although this is effectively a WiP post, I’m not listing it elsewhere as such, as the nature of the work doesn’t merit such an intense photo record. The next post will be of the completed project, but there’s no timeline for it at present. Good to see you’re in the “zone” again, Rob….looks to be another beauty in the works. Just took a few quick snaps for myself and then decided to post them – should’ve done a proper lighting setup! What an amazing project Rob !!!! The wood grain and staining look great. I’ll be watching for the next installment of this masterpiece. The idea for the diorama is a good one. I don’t think I have ever seen anything like that before. Plus it gives you the option of just how much detail you want to include. Cheers, Louis. The natural wood in fact is just varnished and not stained – so nice rich finish as is. You back at it again Rob, I look forward to seeing this one completed. Very nice so far. Thanks, Marc. I’ve waited a while before posting anything with this project as I wasn’t sure it could be recovered, but I think I’ve got it under control now so will carry on. Not the best Endeavour kit on the market, but then for my purposes it doesn’t need to be. Some good old traditional ship modeling. Great to see. Keep it up Rob! Thanks, Ulf. 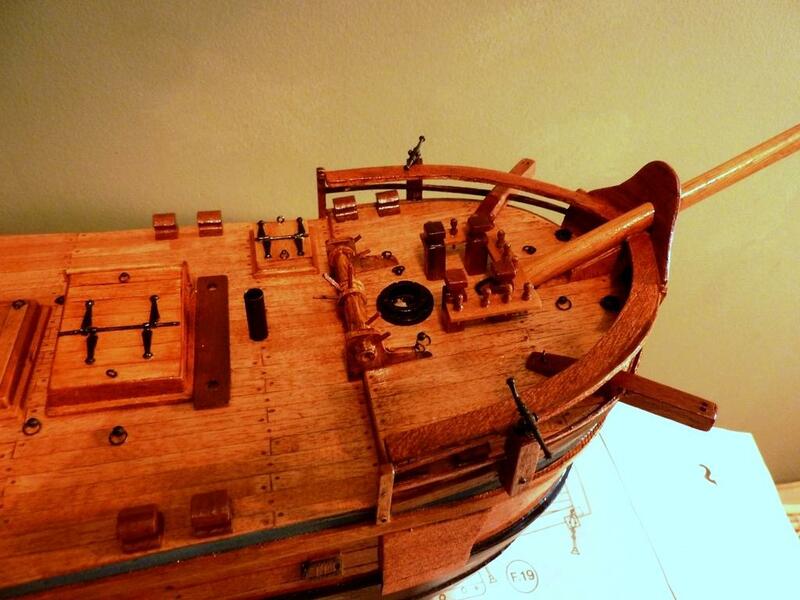 A lot of scratchbuilt wood items thus far as much missing from kit. Aftermarket items tending to be just various hinges and small cast pieces, etc. Hi Rob. I’d love to have followed a WIP on this lady. Look forward to deeming your diorama. The photo below (I’m sure you have seen it) is the Endevour’s seaworthy (not now, unfortunately) replica in Sidney, Australia. Now, THAT is a lot of rigging. 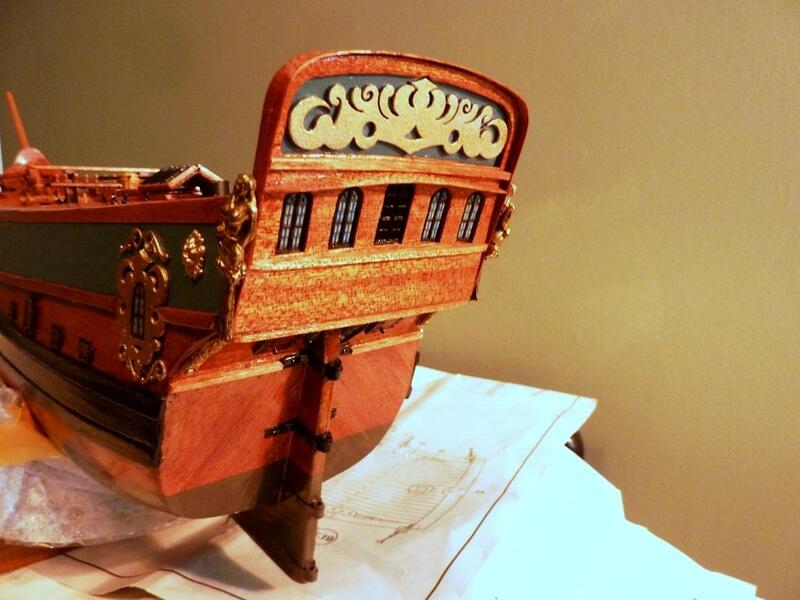 Yes, David, much ado about this version as a replica, as detailed in the Anatomy of a Ship book, but a cracking vessel nonetheless. Onward! Rob, those ‘Anatomy’ books are great, engaging, lovely art, and great stories. Recommended for any ship builder, regardless of subject. Nice to see you back in the shipyard! Not sure I’d ever want to take on someone else’s cast off but I can see where you’re going with this one, Rob. It’s sure to be another interesting, well thought out diorama coming from you. I did the same thing with the Bomb Vessel Granado, which took a lot of work to bring round, but turned out very well in the end – £180 kit I bought fro £35. Just a case of transferable modelling skills, although I recognise ship modelling is a fairly niche area in a world dominated by aircraft modelling. Rob, this is some very good modelling here. I’m really looking forward to the finished product. Cheers, Terry. A number of compromises, but hopefully a result in due course. Well done Rob, glad to see you’re back at it. 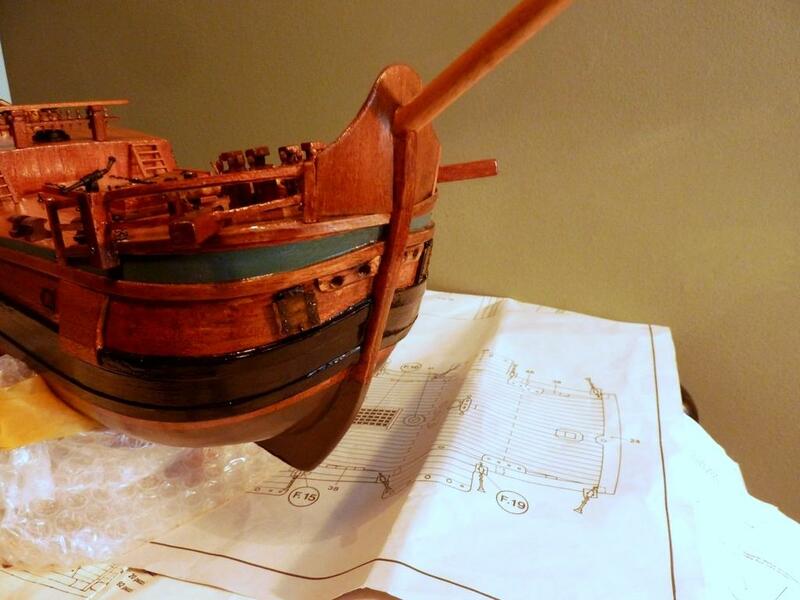 Building wooden ships is a whole different level of modeling. There’s a club here in Cincinnati that builds wood sailing ships as well as river boats. River boats because of the historical nature of Cincinnati being quite a river boat town. Have had the opportunity to view some of their work and amazing doesn’t do justice to their finish products.The rigging alone on their sailing ships would drive me nuts, don’t know how you guys do it. One of their members built a Morgan whaling ship for a friend of mine, spent 320 hours on it, God was it a thing of beauty. Keep going Rob I’m enjoying the view. 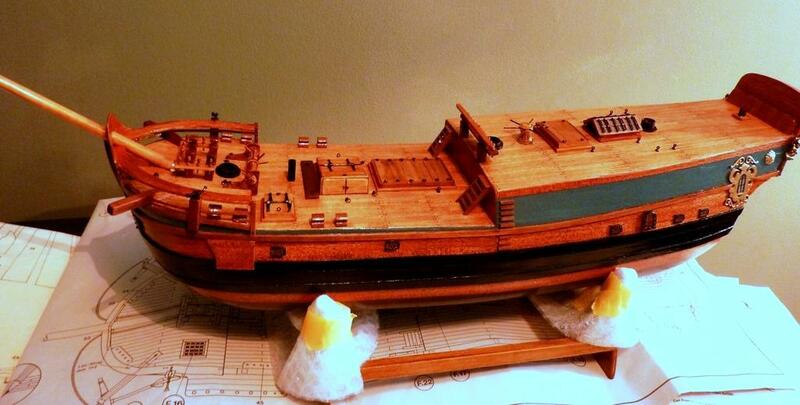 Amati do a very nice kit of the riverboat Robert E Lee in an impressive scale, and at £250 an impressive price as well. 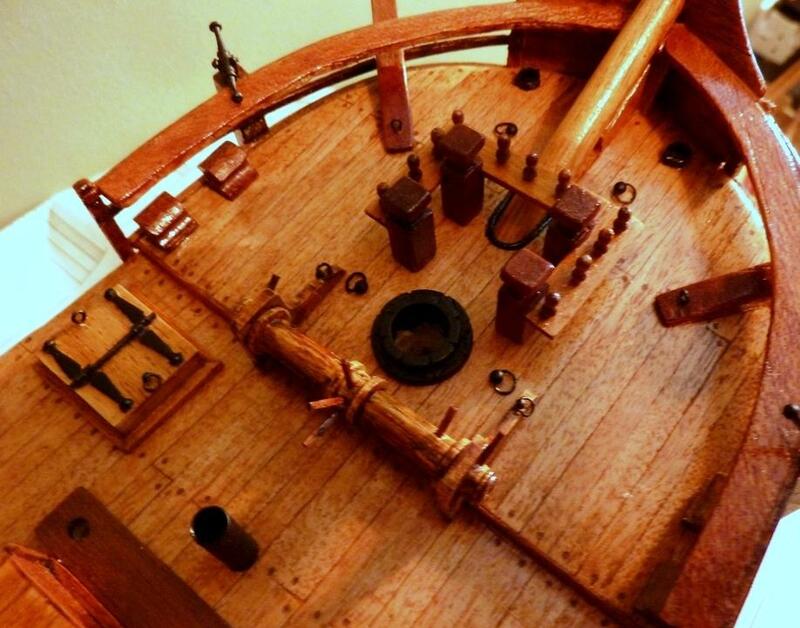 I spent more than 1000 hours on HMS Victory and it wasn’t even the most complex of the examples available. Eagerly anticipating the outcome as always! The dio you’ve got planned sounds like the perfect environment for the Endeavour, and apropos for the circumstances surrounding the kit! Moved on quite a bit since the posting, with most of the deck items now complete and just starting work on the channel and chainplate areas, but only some will be in use as it’s meant to show a snapshot of the refit so not everything ‘perfect’. North American P 51 C1 Mustang 3, FB244, 3 Sqn RAAF Fano Italy 1945.